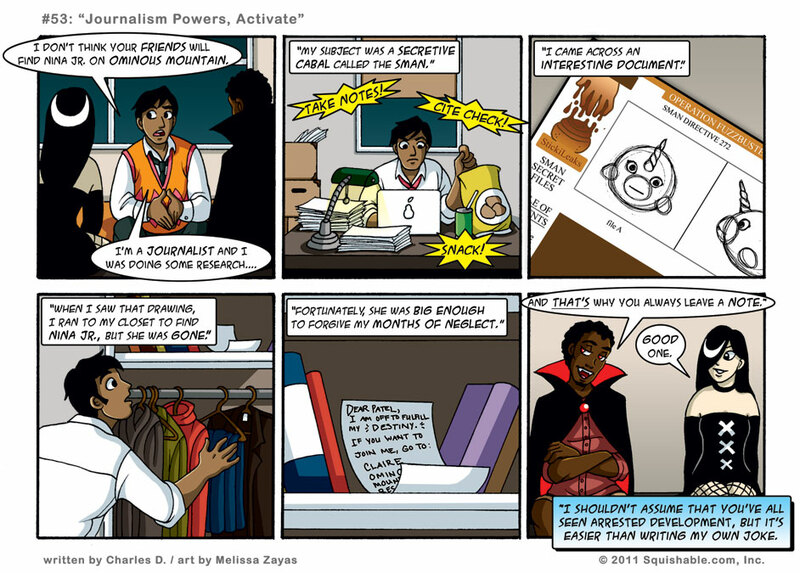 The Fuzzy Five - #53: Journalism Powers, Activate! Hi everyone, Fuzzy Five artist Melissa here, with some pretty neat news! If you (1) love The Fuzzy Five and (2) happen to be in the New York City area next Saturday and Sunday, April 9th & 10th, you can drop by MoCCA Festival for a meet-and-greet with myself and Fuzzy Five writer Charles D.! We’ll be at table B22 with lots of awesome Fuzzy Five stuff…don’t want to spoil the surprise, but you might even be able to meet some of our squishy round cast members. Not to mention that MoCCA Festival is just a whole lot of fun! The Museum of Comic and Cartoon Art (MoCCA) is located at 68 Lexington Avenue, and you can find details and ticket info here: http://www.moccany.org/content/mocca-festival Hope you can stop by! So there TWO nefarious forces at work now? Oh dear! Arrested Development reference! Jagged action bubbles for stupid desk jobs like mine! Patel hearts Nina Jr. after all! StickiLeaks! THIS COMIC FTW. Man, I wish I had *CITE CHECK! * action bubbles around me when I was on law review. I’d have had to beat them back with a stick. Is it wrong that I got the Arrested Development reference before you pointed it out? No, it’s oh so right! Because he saw Nina Jr. in the files of the organization he was researching. Oh. But, who wouldn’t love a squishable! I can’t believe Patel! It was funny, even before I knew it was from Arrested Development. I keep thinking someone is going to quote Bert Gummer at some point (Tremors). Is it just me, or is this comic rather blurry? I don’t think it’s particularly blurry. If you flip back between this one and an older strip, is there a noticable difference? Actually, funnily enough, you have a point! Just figured it out, these are being re-scaled a little. we’ll fix it going forward! good catch!